Jason has improved his swing tremendously in the time that he has been coming to Profectus. 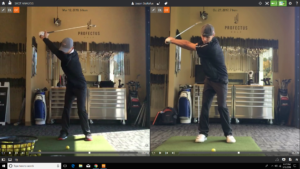 Here’s a before and after picture of his backswing. After improving Jason’s backswing, he wanted to better understand why his bad shots were pushes and hooks. If you watch the recap of the golf lesson above, you’ll see how big of an influence the movement of Jason’s upper and lower body had on the path of the club through the ball.